A Semi Private Lesson (renamed 2015 to Small Group Lesson) is 2-3 people to 1 Instructor, it's not intended for Total Beginners, both riders should be able to Walk and Trot proficiently before being allowed to book, the typical duration is 40 minutes, and it's taught in our Floodlit 40x20m arena. As of 2016, possibly our cheapest option for 2-3 people either Adult or Child riders! A Semi Private Lesson ideally suits couples and friends who wish to improve their riding skills together in the same session. It's not designed for Total Beginners, the minimum skill required to book this type of activity is proficient Walk and Trot. 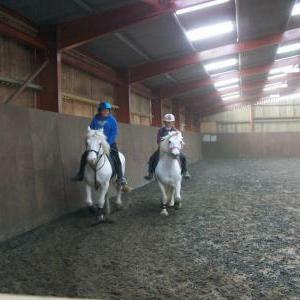 Semi Private Lessons are taught in our Floodlit 40x20 Indoor Arena, they are suitable for both children and adults. The booking is 1 Instructor to 2 riders. The activities taught during the lesson will depend on both riders combined abilities, it's usally best if both riders are similiar in ability. The initial aim of all our teaching is to reach a safe Walk, Trot and Canter standard, if you're of a higher ability already, the session will more than likely involve jumping, and more advanced exercises, or if you have specific goals, tailored to help you reach them. We do offer longer than 40 minutes duration, however, the price is on application in an effort to keep our price list as simple as possible. Semi Private Lessons can also qualify for the Regular Riders Club discount, we don't publish the price for the reasons above, but, it's available on request. Discontinued RRC System - Regular Riders Club discounts would require both clients to book in unison to qualify, this is an additional T&C specifically for Semi Private Lessons. Like normal RRC bookings, to qualify you must maintain a weekly continuous booking through the year, paid monthly in advance (4 or 5 weeks depending on the month). RRC also has benefits, once you maintain a Primary Regular Riders Club booking, all additional riding is heavily discounted, our Club+ discount rate applies to any further riding you do during that month. All our usual Terms and Conditions apply for Semi Private Lessons. The Regular Riders Club has further Rules governing it, these will be provided when joining the club.